Quiet Report – High tea, yes please! Since that fateful December day in 1773 – when the Sons of Liberty protested the tax on tea by dumping boatloads into the Harbor – Boston and tea have been tied together, and they will be for eternity. Today, you can take a more refined approach to celebrating Boston’s role in history by sitting down to an elegant afternoon of tea service at Boston’s Bristol Lounge in the Four Seasons Hotel. A window seat overlooking the Public Garden or a cozy sofa setting is yours for the taking, with an advanced reservation. The lounge serves high tea from 3:00 p.m. to 4:15 p.m. on weekends. You are treated to a respite from wandering the city while you indulge in the time-honored tradition of high tea in the city that made tea something to talk about. Your decisions are limited, as you are presented with two options: the $32 Four Seasons Tea or the $40 Royal Tea, adds a Kir Royal to your tea of choice and a tray of treats. A tower of finger foods arrive with your freshly brewed pot of piping hot tea, and they are yours for sharing. Enjoy the selection of scones, breads, pastries and tea sandwiches (including a divine classic cucumber), while sipping fresh cup after cup of tea. Add a bit more indulgence to your afternoon and top your treats with fluffy scoops of Devonshire cream, smooth lemon curd or fresh strawberry jam, and enjoy giving your tea added sweetness by swirling sticks coated in sugar. Or drop a dollop of honey into your cup. Then sit back, relax and enjoy the variety of snacks and pots placed by your side in the upscale casual atmosphere of Bristol Lounge. 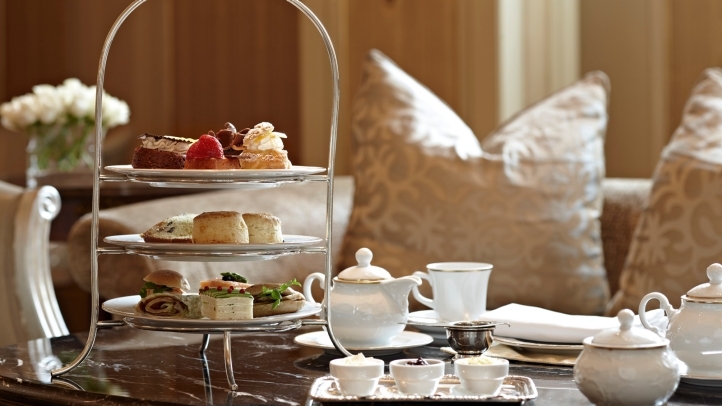 Featuring a selection of savory finger sandwiches, sweet cakes, scones and exotic tea blends, the quintessentially British mid-afternoon delight pays homage to the first afternoon tea served in Europe at the first “grand hotel” The Langham, London back in 1865. 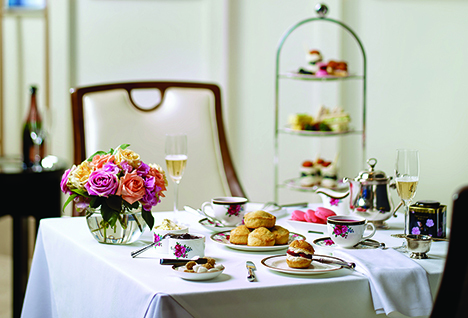 English afternoon tea holds a special place in history and today, The Langham, Boston, continues the tradition with their new “Tiffin at The Langham” afternoon tea service. Indulge and delight your senses with “Tiffin at The Langham” afternoon tea served daily from 2 p.m. to 7 p.m.